A body on the rocks below Dave Rollins' Malibu estate pulls Georgie Shaw and Detective Jack Wheeler into another whodunit. Their investigation soon reveals that the legendary maestro was a man of mystery. Did a secret from his past lead to his death? Or was his killer a scorned woman, a jealous rival, a disturbed fan, or someone close to his heart? When another body turns up, the killer leaves a calling card for Georgie: "Requiescat in pace." She and Jack must scramble to unravel the clues and solve the mystery before the murderer strikes again. ËƒËƒËƒ Who Killed The Maestro? 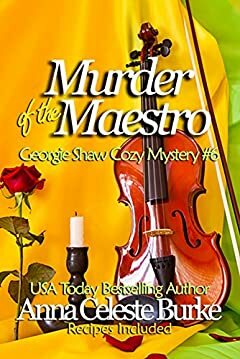 To find out, read book 6 in the awarding-winning Georgie Shaw Cozy Mystery Series by USA Today and Wall Street Journal bestselling author, Anna Celeste Burke.